Home > Breaking News > #1 in a Decade: Apple, Amazon, Alphabet, or Facebook? You’ve probably seen the headlines . Amazon (NASDAQ: AMZN) recently surpassed Alphabet (NASDAQ: GOOGL) (NASDAQ: GOOG) when measured by market cap, making the e-commerce and cloud-computing company the world’s second-most-valuable publicly traded business behind Apple (NASDAQ: AAPL) . At the time of this writing, Amazon is worth just above $740 billion and Alphabet is worth about $720 billion. This major milestone for Amazon shows how rewarding an investment in a strong market leader can be over time. Though Alphabet’s market cap has swelled a notable $132 billion in the last twelve months, Amazon’s has skyrocketed by a mind-boggling $324 billion. Just one year ago, Amazon was worth about $418 billion and Alphabet was worth about $588 billion. Meanwhile, other game-changing megacap companies like Apple and Facebook (NASDAQ: FB) have similarly seen their market caps (and stock prices) surge. Data source: YCharts. Table by author. The caveats: 1) Microsoft is certainly in the same weight class as these four and has made impressive strides in recent years, but I’m excluding it for the purposes of this thought exercise because its market cap isn’t terribly different than it was in the year 2000. For comparison, back then Apple and Amazon were each less than 5% of their current size, Alphabet was a private company, and Facebook wasn’t even born yet. 2) The largest tech company a decade from now could be a company that’s not mentioned in this article (see how quickly Facebook’s ascended), but let’s focus on the race leaders. As the current king of market cap, Apple has consistently proven to investors its ability to keep growing its business — even as product segments mature. When Mac sales growth slowed, Apple’s growth was fueled by iTunes and the iPod. Following the iPod was iPhone, the App Store, the iPad, Apple Pay, Apple Watch, Apple Music, and more. Just as noteworthy, Apple has maintained steady growth in some product segments years after they mature. Mac revenue, for instance, hit a record high in Apple’s fiscal 2017. In the trailing 12 months, Apple’s revenue and operating income rose 9.7% and 8.3% year over year. Though higher iPhone revenue helped during this period, rapid growth in Apple’s services and “other products” segments means these segments are contributing to growth as well. While Apple’s revenue and operating income growth is notable, it’s unlikely that the tech giant will be the biggest of this bunch when it comes to market capitalization in 10 years. As you’ll see below, Amazon, Alphabet, and Facebook, are all growing faster than Apple. Of course, this doesn’t mean Apple isn’t a good investment. While it has been increasingly difficult for Apple to grow its top- and bottom-line, the tech giant has been able to grow earnings per share and, subsequently, its stock price, at a more rapid rate than it’s growing its market capitalization. Apple has been able to pull this off by repurchasing shares in droves. 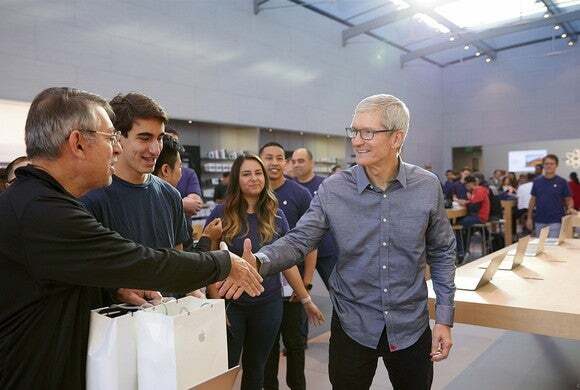 Highlighting the impact of its aggressive share repurchase program, Apple’s earnings per share increased 22% year over year in the trailing 12 months, more than doubling its operating income growth during this period. Amazon is undoubtedly a top contender for becoming the most valuable of these four tech giants by 2028. Though its valuation may appear stretched today, with a price-to-earnings ratio of 327, Amazon’s business has not just been growing fast recently, but it’s been growing at accelerating rates. 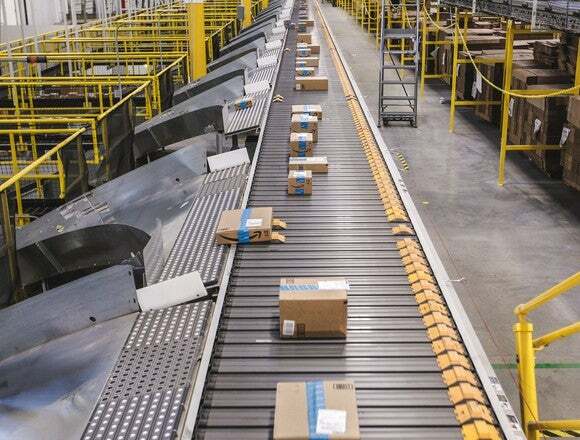 Amazon’s net sales in 2017 increased 31% and operating income pulled back 2% year over year as the e-commerce and cloud computing company doubled-down on investing in growth areas like fulfillment centers, Amazon Web Services, original content, and smart speakers. In Amazon’s most recent quarter, however, net sales climbed 38% and operating income soared 69% year over year. Though Amazon’s operating income growth will likely be volatile since management’s appetite for growth seems to be as aggressive as ever, investors should expect more sharp revenue growth in the coming years. Highlighting the momentum in Amazon’s business, its growth drivers are broad-based; North America and international net sales rose 33% and 23% year over year in 2017, respectively, while Amazon Web Services net sales jumped 43% during this same period. Of course, when Amazon’s heavy investing finally slows, operating income could skyrocket as the company’s operating margin expands. This would likely help fuel further strong growth in market capitalization. Alphabet’s revenue in 2017 increased an impressive 23% year over year to $111 billion while operating income during this period increased 10%. With both revenue and operating income growing by double-digit percentages, and with strong trends in Alphabet’s core online search business showing no signs of letting up, Alphabet could grow at similarly robust rates for years to come. Indeed, analysts expect Alphabet’s revenue and earnings per share to grow at average annual rates of 25% and 11% over the next five years. 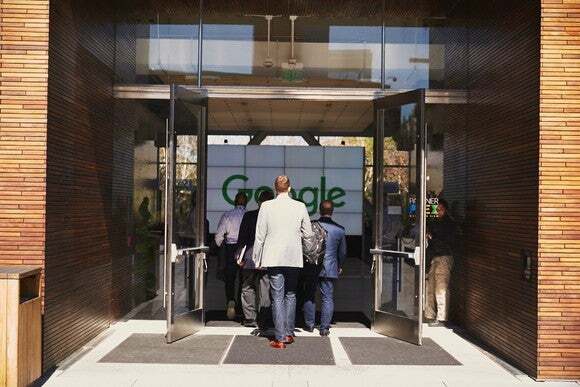 And beyond Alphabet’s core search business, the company’s Google other revenue, which is primarily driven by the Android app store, Google-branded hardware, and cloud services, has been becoming an increasingly important driver for Alphabet’s growth. Google other revenue in Q4, for instance, was up 39% year over year. Considering its momentum and Alphabet’s massive economic moat as the world leader in online search, its price-to-earnings ratio of just 32 is fairly conservative. Facebook is the fastest-growing company of these four, but it’s also the smallest, with a market capitalization of $456 billion at the time of this writing. Facebook’s financial statements lately look like an investor’s dream come true. In 2017, the social network’s revenue rose 47% year over year, helped by 49% growth in advertising revenue. 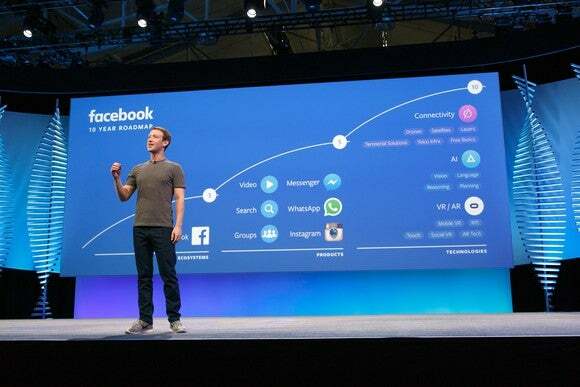 Meanwhile, Facebook’s operating income grew 63%, thanks to revenue growth that outpaced operating expense growth. Though Facebook is currently the fastest growing business of these four, it’s arguably the least likely to be the largest in a decade when measured by market cap. First of all, Apple already has a $412 billion head-start on Facebook, and even Alphabet is worth $264 billion more. In addition, if one of Facebook’s key drivers for advertising revenue growth moderates, Facebook’s sky-high growth rates could decelerate quickly. One of these drivers — ad load — has already slowed meaningfully recently. And if ad pricing growth slows as well, Facebook’s growth could begin to look more like digital advertising peer Alphabet. Finally, mounting concerns about Facebook’s recent Cambridge Analytica debacle has surfaced valid concerns about the liability risk of Facebook’s enormous responsibilities with its users’ data. Though this particular issue could turn into a non-event over the long-term, there’s no denying that Facebook’s growing efforts to curb security threats is going to significantly impact the social network’s profitability. The company expects operating expenses in 2018 to increase 45% to 60% year over year, citing “sizable security investments in people and technology to strengthen our systems and prevent abuse” as the primary driver of this increase. Of course, this doesn’t automatically make Amazon the best investment of these four. Over the long haul, market capitalization and stock price trends don’t always move in tandem. Apple, for instance, has been able to grow its stock at a much faster rate than its market capitalization as it continues to boost its capital return program. But Amazon’s undeniable growth potential at least makes a case for holding onto Amazon stock over the long haul. Which company do you think will be the biggest in a decade? Vote in this poll . John Mackey, CEO of Whole Foods Market, an Amazon subsidiary, is a member of The Motley Fool’s board of directors. Suzanne Frey, an executive at Alphabet, is a member of The Motley Fool’s board of directors. Teresa Kersten is an employee of LinkedIn and is a member of The Motley Fool’s board of directors. LinkedIn is owned by Microsoft. Daniel Sparks owns shares of Apple. The Motley Fool owns shares of and recommends Alphabet (A shares), Alphabet (C shares), Amazon, Apple, and Facebook. The Motley Fool has the following options: long January 2020 $150 calls on Apple and short January 2020 $155 calls on Apple. The Motley Fool has a disclosure policy .